The warm, smoggy afternoon in Santiago is siesta time; at least it was for us. After our power naps, we headed back out to see one of Santiago’s iconic sights-Cerro San Cristobal and the statue of the Virgen de la Inmaculada Concepcion. It just did not seem like a good idea to travel the great distance to Santiago with much more ground to cover ahead of us and not visit the hill named after the patron saint of travel safety. Before going to Cerro San Cristobal, we decided to eat. 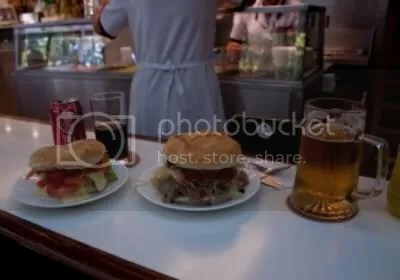 Having eaten recently, we were hardly hungry, but we couldn’t pass on Fuente Alemana (210 Pedro de Valdivia), a noted sandwich place very near The Orly, our hotel in Providencia. Situated on the edge of a residential neighborhood, Fuente Alemana looks from the outside more like a small town’s newspaper office than a restaurant. For a moment, as we walked to its entrance, we thought that the restaurant, with its draperies drawn shut, might not be open. Once inside, the restaurant was busy with most of the bar stool style seats lining the counters and the walls full of patrons. We sat at the counter overlooking the sparkling stainless steel of the kitchen. 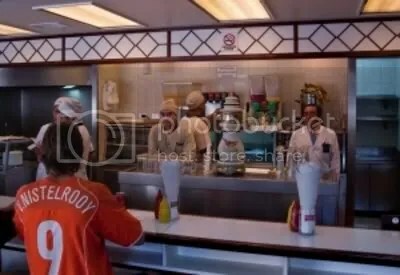 The stainless steel and the staff’s white uniforms and hairnets gave the interior a 50’s era dinner appearance. it plaintively trying to figure out how to lift the overstuffed sandwich and get a significant portion of it into my mouth. Eventually, I gave up and used a knife and a fork. A sideways glance revealed that this was the technique used by the all the other diners. In the operational sense, these were not what the Earl of Sandwich had in mind. Taste-wise, the sandwiches at Fuente Alemana were most analogous to Mexican tortas that you can find in the States. The ingredients on the Lomito included luxurious shredded, slow cooked pork loin, a tomato paste-like condiment, mayonnaise, and the ubiquitous avocado that you seem to find on nearly every plate in Santiago. Mustard and hot sauce in bottles on the counter let you spice the sandwich to your particular taste. Overall, it was a filling, comfort food experience. The meal cost us about 8000 pesos (around $13 USD) for two sandwiches, a large beer, and a Coke. We’d definitely seek it out if we were back in Santiago. Also on the same street in Providencia was another stylish sandwich place, Domino’s, which seemed to have similar offerings as Fuente Alemana. We’d have to check this one out as well to see whether their food offerings conform to the Earl of Sandwich’s design standard. If you are in Santiago and looking for lunch, head to Fuente Alemana in Providencia. Good sandwiches, good service, and a cool, retro restaurant interior.